Celebrating Our Graduating Scholars: Zaphire Alonso Duarte! A picture of Zaphire at her graduation from San Diego City College. 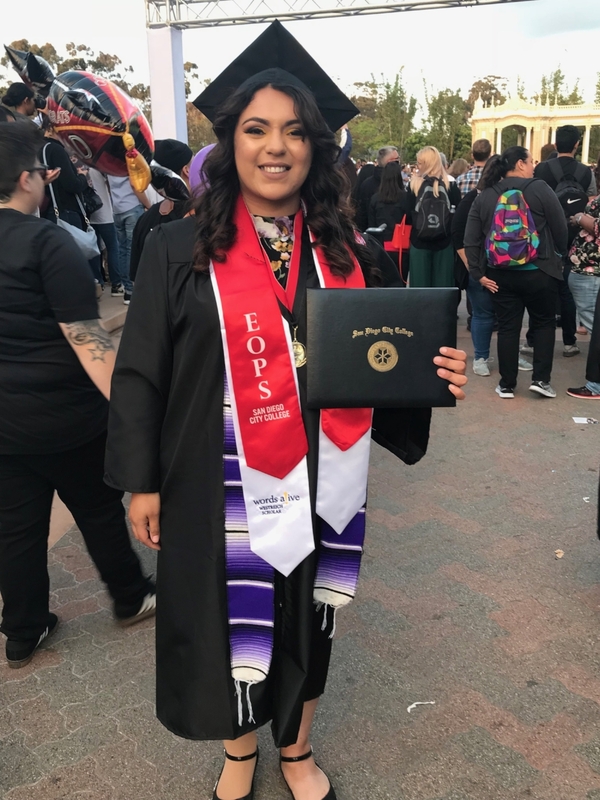 We interviewed Zaphire Alonso Duarte to learn more about her college experience and her experience with the Words Alive Westreich Scholarship Program. 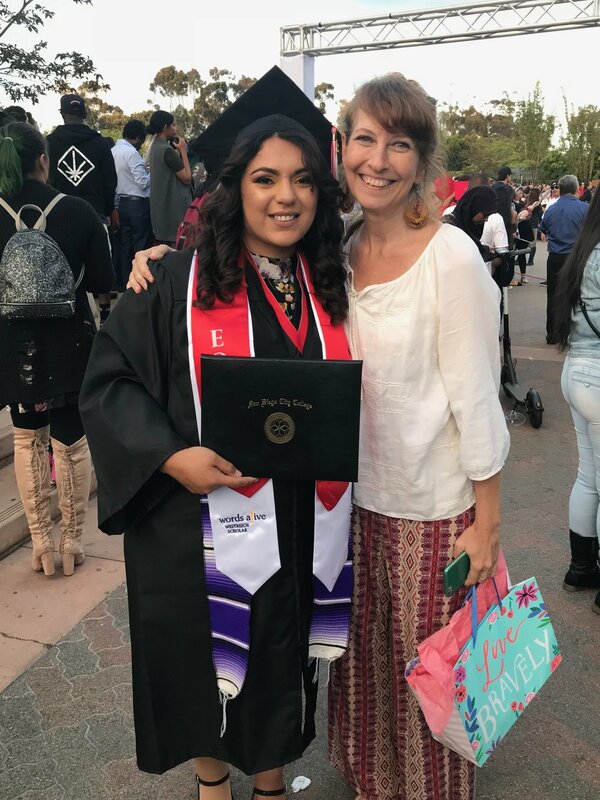 A picture of Zaphire with her mentor, Tammy Greenwood, at Zaphire's graduation from San Diego City College. 1. When were you first introduced to Words Alive? I started being involved in Words Alive Adolescent Book Group during high school, since I was in 11th grade. I learned a lot of different books, and that opened me up to read more books. After high school in 2014, Words Alive has been my support system. 2. How has your experience with Words Alive affected you? Words Alive has helped me more than just financially. The Words Alive program has been my support system personally and academically. I am extremely thankful for all the people who are part of the staff, they are the best in always being on top of our things. 3. What have you accomplished this year that you are most proud of? I have graduated from San Diego City College after four years, and will be transferring to San Diego State University. 4. Tell us about your favorite college memory. My favorite college memory was being able to have great moments with my classmates, for example take time out of class to go to the beach or to the movies. Save the Date For Our Annual Art & Literacy Event! 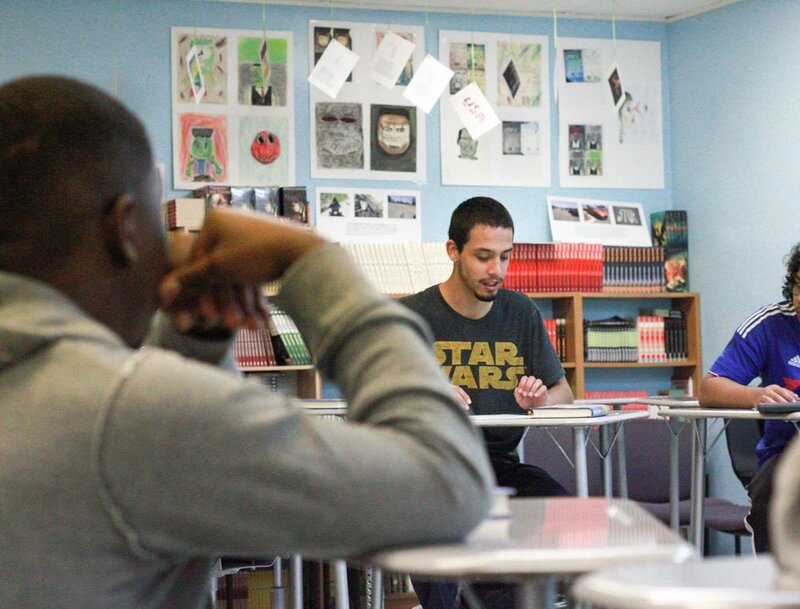 At Words Alive, our goal is to help the students in our programs make connections between books and themselves, others, and the world. By learning that books have implications beyond being "just another school assignment", we hope to help students and families fall in love with reading and become life-long learners. One way we accomplish this is through the Arts Component of our Adolescent Book Group (ABG). Each year, ABG students participate in a program-wide literacy and arts project that enhances the reading experience and encourages students to think critically about themes in the book and their own environment. An image of a student from Monarch holding her piece of the communal sculpture. Her piece was based around the theme, "grief." This year’s project, called "The Love You Give," is a response to Angie Thomas' #1 bestselling novel The Hate U Give. The project creatively weaves the book’s message and themes into a communal wood sculpture designed by artist Isaias Crow, facilitated by Words Alive volunteers and produced by students who attend Juvenile Court and Community Schools. There were increases in critical thinking and literacy skills among students who participated in the LTA Program. LTA students provided interview responses using language associated with higher grade levels and with more words than those who did not go through the program. All of this explains why we continue to coordinate this project year after year. This study, and others before it, supports the idea that art education teaches more than just art: it helps to expand critical thinking and language development. We know first hand how meaningful this project is to our students, and how beneficial it is to some of them to approach learning in a different way. An image of a student from 37ECB holding his piece of the communal sculpture. His piece was based around the theme, "bravery." After nearly a full semester working with the students at 37ECB, I looked forward to the Arts Component project for The Hate U Give. Each week, we saw a range of participation levels and interest from the students—from those who would barely utter a word to those who gladly took charge of the discussion—and I expected (hoped!) that most would be into the art project. I wondered, week to week, what the students were really getting out of the discussions we were leading. Some that would be really into it one week wouldn’t speak up the next; others seemed constantly distracted. But in every session, I was always impressed at least once by someone’s insight or reaction to the book. What I enjoyed most about the Arts Component was seeing something from every student. I was thrilled to see their artwork and hear how each related their piece to the theme of bravery. I had a hunch that at least a couple kids would thoroughly enjoy getting to express themselves in a different way. And surprise, surprise: once we set up the paints, two of the quietest students immediately picked a spot together away from the rest of the group and settled down to work. They were so intent, and took such care and thought in perfecting their pieces, that we had to give them extra time the following week to finish painting. 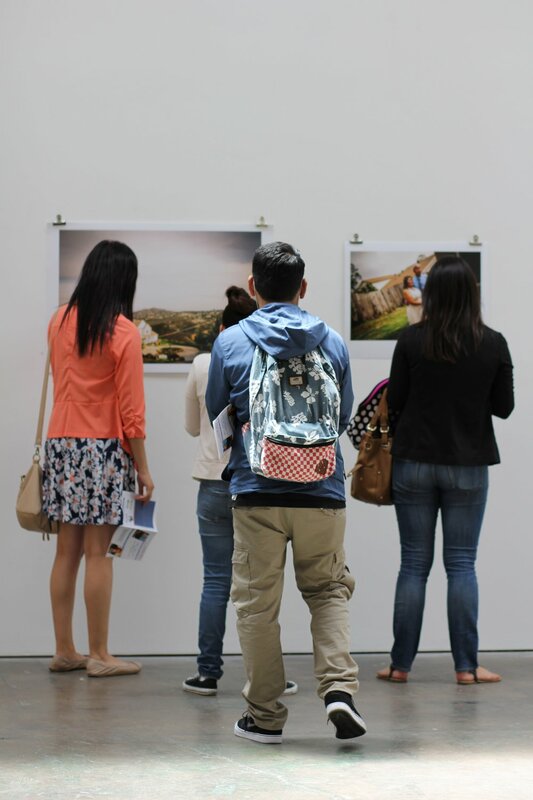 A reception will be held from 6 to 8 p.m. Friday, June 8 at San Diego Art Institute, 1439 El Prado in San Diego. You won't want to miss the chance to see these inspiring pieces! The San Diego Art Institute is also hosting a community art day, which will showcase the exhibit and artwork from other Title 1 schools from 11 a.m. to 4 p.m. Saturday, June 9. We hope to see you there to celebrate art and literacy with us! A teacher and student holding a camera together during our Arts Component focused on photography. Students viewing their work in a local gallery. Students viewing their work from the 2017 Arts Component at the Chuck Jones Gallery in Downtown San Diego. Students performing monologues as part of the Arts Component. All of our programs aim to help students not only understand the importance of literacy but also fall in love with reading themselves. Our Words Alive Adolescent Book Group takes many different approaches to this, from hosting book club style discussion sessions to working on projects to writing workshops. Each year, we also hold an Arts Component that focuses on connecting a book, theme, and art medium into one exhibit created by the students. As an organization that focuses on increasing literacy in our community, part of our mission is to inspire a commitment to reading. Art brings that opportunity to inspire by allowing the conversation to be more accessible to those who may lack the confidence or interest in reading. Teaching artists felt that their participation in LTA led them to change their teaching practice by trying new things with students, especially finding strategies to reach below average students. This study, which included over 400 students in the state of New York, echoes the studies of others that indicate that art education teaches more than just art: it helps to expand critical thinking and language development. Additionally, with classroom sizes steadily increasing, it is important to note that bringing in supplemental forms of learning, such as art education, can appeal to those who are visual or kinesthetic learners and may be overlooked if they learn in different ways compared to their classmates. How Can You Help Bring Art Education Into The Home? Parents don’t need to be artistic to encourage art education in the home. As noted by Art Therapist Anna Reyner, there are a few simple ways to bring the arts into your home that will help to encourage and develop the same skills that are important for reading and writing. Make art a family activity. Have a corner dedicated to art activities (This can be the same as your reading corner!). Relate drawings/art projects to books you’ve recently read. These tips, though more so applicable to young children, develop habits and interests that can prove helpful throughout the child’s future schooling experience. Looking at the last tip in the list above (“relate drawings/art projects to books you’ve recently read”), this is exactly what we aim to do in our annual Arts Component. As mentioned previously, each year we have our students focus on a different book, theme, and art medium. This year, our students are going to be creating murals based on the novel The Hate U Give by Angie Thomas, and using the theme “duality” as inspiration. Through this process, students learn how to connect the text to themselves and the world through art and, in the end, have the chance to see their art professionally displayed in a local gallery. In many American schools, standardized testing is emphasized to the extent that art education can fall to the side as an extracurricular activity. By understanding the benefits art has on the reading, writing, and overall literacy skills of an individual, we can bring that same awareness back in to the classroom and home. Partnering art and literacy education serves as a multi-faceted teaching tool that can create a bigger, more meaningful impact. For more information on our upcoming Arts Component, or any of our other programs, visit the main section of our website.